It’s been a wild couple years for The Velvet Addiction, their debut EP ‘Volume 1’ defining their instantly iconic style and sound with singles Take Me Back, I Won’t Go and Stuck On You, which landed the guys on the likes of MTV, RAGE & TRIPLE M, not to mention sold out shows and debuting on the international circuit! Now the efficinardos of Australian classic rock are ready to evolve with their sophomore EP ‘Volume 2 - Lost In The View’, a more refined, Australian take on the iconic sounds of 70’s rock and roll! Join the Melbourne men with the most swagger as they hit the Australian tour circuit in celebration of ‘Volume 2 - Lost In The View’ featuring roadtrip-ready singles Diamond In The Sky and Give It Up. 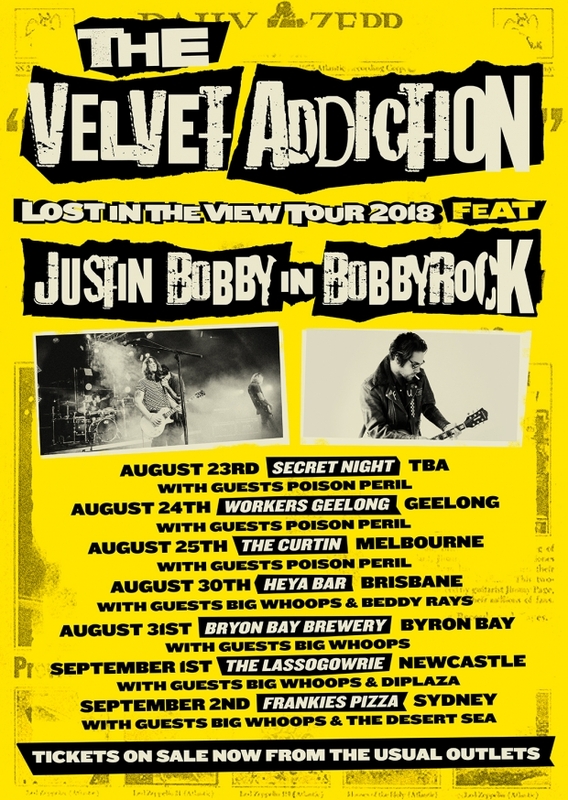 The Velvet Addiction are super excited to be welcoming MTV’s ‘The Hills’ star Justin Bobby to Australia to special guest star across the tour with his band - Bobbyrock. BobbyrocK - a three-piece, punk rock outfit from California, USA, fronted by bad boy Bobby himself, packing all the ego and attitude he’s synonymous for. This band doesn’t disappoint, showcasing the roots of punk rock! After just finishing a US tour with 50 + dates, Bobbyrock are set to hit Australian soil for the first time!